A payment gateway provides a means of processing payments for items sold, like registrations and products. Event Publisher Supports receiving payments for events using a PayPal account. Please note, Event Publisher requires that your PayPal account is configure as a "premium", "merchant", or "business" account. You will be prompted to upgrade your PayPal account during the PayPal Configuration Process. Complete the Billing Agreement Authorization. Authorize Event Publisher to Interact with your PayPal account. Confirm if you would like the ability to refund purchasers their fees. Select the currency you would like to use to sell your items. Please view the video tutorial below to setup your Payment Gateway, and receive payment for registrations and products you add to your events. Your Browser does not support playback. Follow the steps below to accept the billing agreement. Log into your existing PayPal Account. Create a new PayPal Account. After accepting the agreement, you will be brought back to the payment gateway screen to complete Step 2. Follow the steps below to authorize Event Publisher to interact with PayPal. Once logged into your PayPal account, you will need to click the "Grant Permission" button. After clicking "Grant Permission" you will be brought back to the payment gateway screen to complete Step 3. The final step in configuring the PayPal Payment Gateway is to supply your account username (email address). Follow the steps below. Type the email address associated with you PayPal account. Click the Save Button below the Username field. 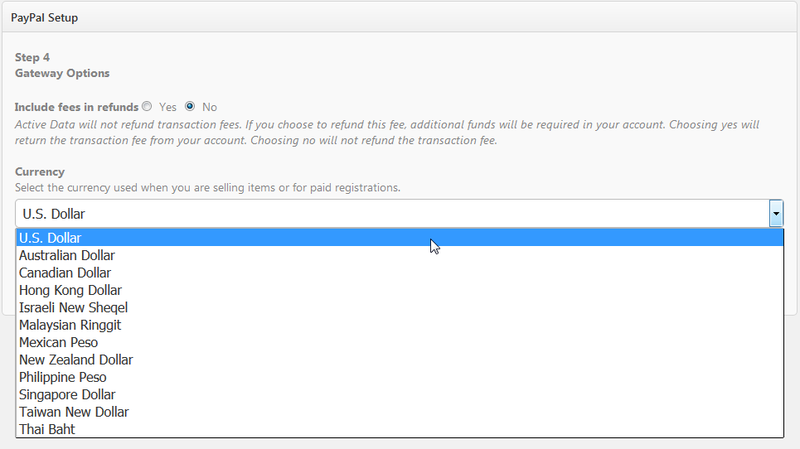 This option allows you to configure how refunds handle processing fees paid during a transaction. By default, "no" is selected. There are two available options. By Default the radio option ,"no" will be selected for "Include fees in refunds". Upon refund, the buyer will be refunded the full cost of the item that they registered for only. For example, if the purchase was for a $50.00 registration they would be refunded $50.00. Upon refund, the buyer will be refunded the full dollar amount of the transaction. For example, if the purchase was for a $50.00 registration and inclusive of fees the total cost of the transaction was $52.24 they would be refunded $52.24. The total fees of $2.24 were paid to Active Data at the time of transaction. These fees are not refunded by Active Data. The PayPal Account specified in the Payment Gateway Configuration will be responsible for funding the $2.24 resulting in net loss of $2.24 from the PayPal Account specified in the Payment Gateway Configuration. This option allows you to configure the currency to use with PayPal when you are selling items or using paid registration. By Default, U.S. Dollar will be selected. Click Clear to remove your acceptance of Active Data's Billing Agreement. Selecting this link will prevent you from collecting revenue from registrations and purchases. Users on your site will be unable to complete registration, or purchase items that have a cost associated with them. Click Save to save your changes and return to the Site Settings page.